When I began to write about the Satyajit Ray film ‘Kanchenjunga’, I admit that I reached for the DVD copy that I had. For a film that is about the kind of Bengali people that many of Ray film watchers today would know far better than the poverty of Pather Panchali or Ashani Sanket, this is not as widely watched. It is a story of the quiet changes that happen to families with time, so subtly as to often go unnoticed, but of great importance none the less. The events are set against the physical backdrop of Kanchenjunga, the second highest peak of the Himalayas. Ray uses the mountains as both prop and metaphor; showing the uphill struggle of some characters, the monotony of the existence of others and a heightened sense of confidence that various characters begin to enjoy as they conquer the mountain in their own ways. The story depicts the last day of a stay in Darjeeling for a wealthy family. The film begins with an introduction to the family members who are dominated by the father, Indranath, played superbly by Chhabi Biswas. Biswas was one of Ray’s favourite actors and when he lost his life in a head on collision between his car and a truck five weeks after the release of this film in 1962, Ray was devastated and stopped writing parts for middle aged men; that quintessentially Bengali institution known as the ‘Bhadralok’. He believed that Biswas was one of the very few actors of the time who possessed the high degree of acting ability required to bring the character to life. In the film, Indranath’s wife Labonya seems wearily acquiescent to her husband’s word being law. elder daughter Anima looks unhappy while her husband Shankar advises his sister-in-law Monisha to not marry a man without first falling in love; thus confirming the idea that all is not well in his own arranged marriage. Monisha is shown to be a timid girl who does not question what is planned for her. As the day progresses, an unrelated uncle and nephew duo are shown climbing the steep steps leading to the Darjeeling Mall. The older man is breathless and unable to talk after the climb which parallels his own life of hard graft. When they find the industrialist and his family graciously taking the air, the uncle attempts to remind Indranath that he was once house tutor to the only son of the family, down to the year of his employment. The contrast between the importance of this memory to the poorer man and Indranath’s inability to recognize him is as stark as the difference in their personal circumstances and is made worse by his desperate plea that his nephew Ashok be granted a job. Indranath is a man whose Anglicized manner and clothing belie his close links to the patriarchal belief systems of the past. Having achieved success during the recently ended British period, he is regretful over their departure from India and derides the role of revolutionaries including his own classmates in gaining independence. He wants Monisha to marry a foreign returned man, Mr Banerjee, who is considered to have ‘good prospects’. He is unable to appreciate things beyond his own materialistic interests. He fails to see both his own and elder daughter Anima’s marriages as one-sided and unhappy and responds to his brother-in-law’s delight at finding a long sought after bird by asking whether the creature can be roasted for eating. He represents the sort of Anglophile post-colonial mentality that Ashok, a young character in the film, seems to be struggling against as a representative of the new order. The film unrolls in the form of several conversations between pairs of characters as they take long rambling walks. At no point in the film are these characters more than a few minutes apart from each other. I felt the different stretches of mountain roads were almost an allegory for the different paths people take. The married couples have their conversations in situations where they are generally static. The younger un-married characters such as Monisha, Mr Banerjee and Ashok are shown walking almost constantly. The characters are fleshed out through the film. Monisha’s prospective groom, Mr.Banerjee talks about his professional achievements and indicates his liberal lifestyle by referring to the company of women he enjoyed abroad. As he understands Monisha’s coolness towards him he shows an attitude which contrasts with her father’s intolerance. Monisha seems to come alive only while interacting with Ashok who tells her that he has turned down the job offered by Indranath; he mentions the fact that the mountain and their surroundings have enabled him to feel like a giant and that he might not have dared to say no had he been behind a desk in the city. Their friendship is a chapter left unexplored but a growing bond between the two is hinted at despite their disparate social situations. The bitter exchange between Anima and Shankar begins with a barrage of accusations by each. The conversation takes place as they watch their daughter and the surrounding scenery and covers problems that have taken place in the city far from the mountains around them. As they talk, they seem to grow expansive and attain a degree of forgiveness. They both agree to make another attempt at saving their marriage for the sake of their child who is shown constantly riding a horse through Darjeeling, in a possible reference to the set patterns that people will fall into. Labonya’s brother Jagadish is a keen birdwatcher who seems less worldly but understands the situation of his relatives better than they do themselves. As a result of his unspoken encouragement Labonya takes on the role of an assertive parent after years of blindly following her husband’s dictates. The scene where she is shown singing while sitting alone on a bench, seemingly to the mountain and for herself epitomizes for me her metamorphosis into a human being who does not need anyone else to tell her what to do or how to feel. The song is one by Rabindranath Tagore that speaks of the angst of being exiled and living in doubt and sorrow. The use of Rabindra Sangeet ties this film firmly to the soil of Bengal and is another of Ray’s skilful touches to indicate her traditional roots while speaking of the torment within her. At the end of his walk, the father arrives at a previously arranged point, expecting to meet the rest of his family but no one is there. He is unaware of the changes that have taken place within the family as they take the first steps to free themselves from the boundaries he has set for them. As the mist lightens, Kanchenjunga is revealed in its full glory but Indranath is too pre-occupied with his thoughts to notice it or appreciate it, despite having missed out on this throughout his entire stay. This was Ray’s first original screenplay and also the first film that he shot in colour. Colour has been used to great effect throughout the film. The brilliant skies, the dense grey mists rising out of the wooded valleys and the soaring mountain above all the human activity – all these create a mise-en-scene that is as far removed from the city the characters come from as is imaginable. One is able to imagine that each character has drawn strength from their surroundings and from the presence of Kanchenjungha, as Ashok admits to Monisha. The sound track is also instrumental in furthering the ambience of the location. The film makes great use of local folk songs to accompany the hand drawn credits which were done by Satyajit Ray himself. Background sounds such bird calls, the radio and yak bells serve brilliantly in setting various scenes. It is a contemplative movie – quiet and slow, filmed as a series of conversations punctuated by sudden spells of activity; an ode to the spirit of progress and social change against the setting of the glorious mountains. It is proof of Ray’s expertise as a film maker that he manages to produce a film that engages the viewer with images as well as the dialogue which is imbued with multiple layers of interpretation achieved through attention to a multitude of details. The power of the film comes from both this and the sensitive performances of the cast. Ray’s remarkable achievement is in making us become deeply aware about the fortunes of this cast. We completely understand why it is necessary that the wife becomes a person capable of independent thought, or that the father is overthrown as the lawmaker of his kingdom and that each of the young people come to an understanding about their own roles in life. He manages to convey this and much more throughout the film’s entirety, through a beautifully crafted ode to both human nature and the glory of nature that is Kanchenjunga. Ruma Chakravarti was born in Africa, had her schooling in India and has lived in seven countries. A high school mathematics teacher in her other life, Ruma is an avid blogger, writer and people watcher. 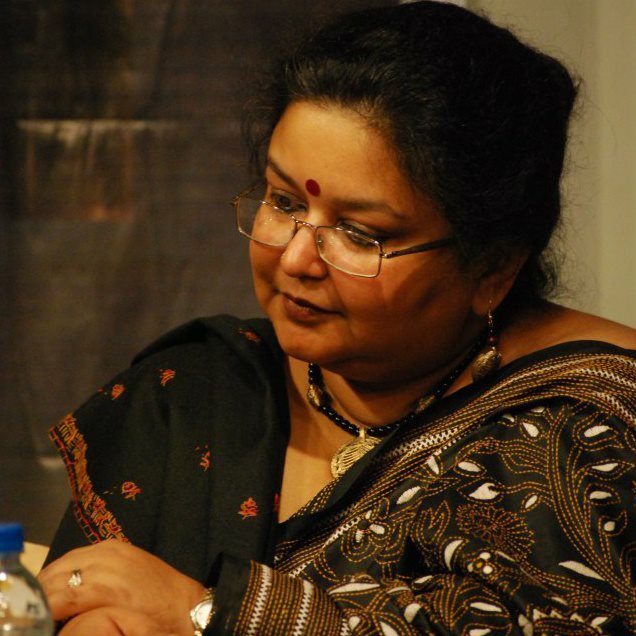 Her interests include Rabindranath Tagore, reading, folklore and music, crafts, gardening and films. She currently lives in Adelaide, Australia with her family which includes three children, one dog and one rabbit.